Pennsylvania Avenue is a separate National Park Service site. Not completely certain of the process that makes these designations. But in trying to find a "shot" for the purpose of this blog (and to compete another of the 417 sites) I found this plaza at the end of the Avenue - at first it seems just a large flat space but when you walk on it is has quotes, line drawings of buildings, like the White House and much more. 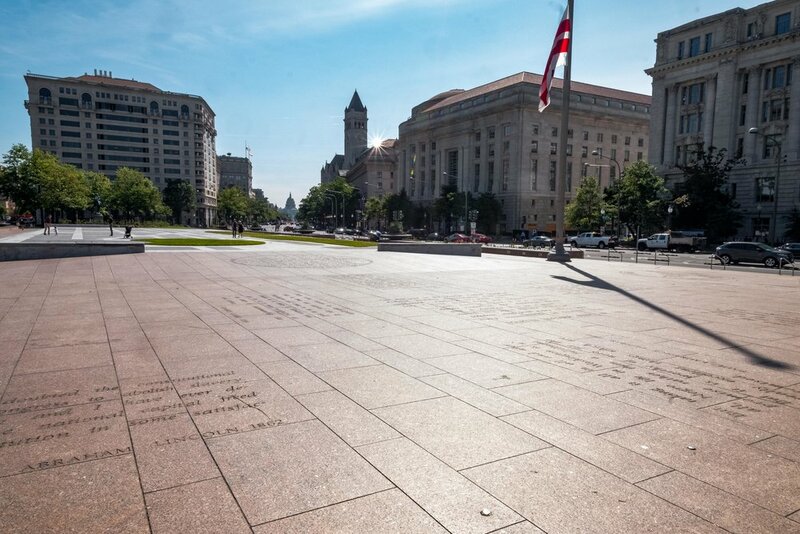 This is looking along the nearly entire length of Pennsylvania Avenue from the plaza to the Capital. That building with the tower is the Old Post Office. From the NPS.gov site: "A street unlike any other. It is known the world over as the heart of the Nation's Capital. America's history has marched, paraded, promenaded, and protested its way along the Avenue."